New year, new grumbles. Commuters on the North-South Line were late for their appointments this morning when a train fault hit Marsiling MRT station around 8am. SMRT alerted commuters to add half an hour to their travel time from Woodlands to Yew Tee MRT stations towards Jurong East. This was refuted by commuters who tweeted out that the train fault was actually affecting both directions — even those heading towards Marina Bay were also delayed. 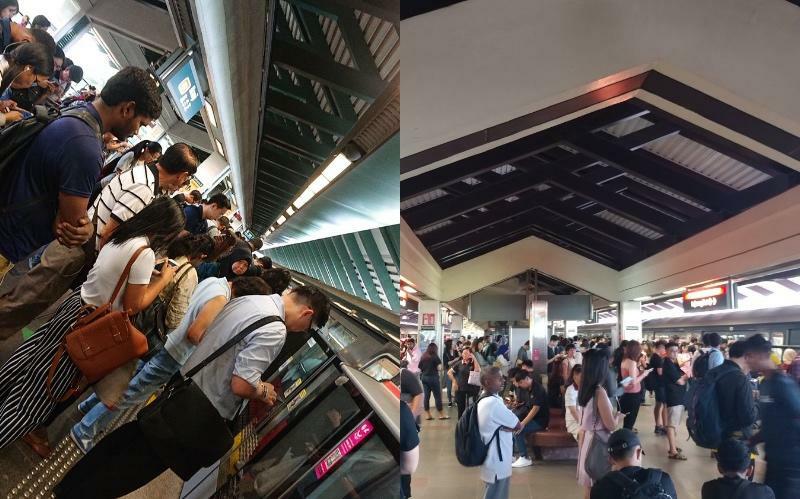 Others noted that the train fault affected commuters beyond just Woodlands and Yew Tee, with one individual stating that he had been waiting for the train to depart Sembawang MRT Station for 40 minutes. Woodlands to YewTee only ? I have been standing in the train at Sembawang since last 40 minutes..
Eh u dont cb. Khatib also affected why u no post? Platform full of people, incoming train full of people. Why u always lying? Free bus services were launched, but only between Woodlands and Yew Tee. Around 8:30am, SMRT reduced the additional train traveling time to 15 minutes, and then 10 minutes at 8:52am. [NSL] UPDATE: Free regular bus svcs btwn #Woodlands and #YewTee. Our station staff will assist. [NSL UPDATE]: Due to a train fault, pls add 15mins train travel time from #Woodlands to #YewTee towards #JurongEast. [NSL]: Due to an earlier train fault, pls add 10mins train travel time from #Woodlands to #YewTee towards #JurongEast. Free regular bus svcs btwn #Woodlands and #YewTee are still available. Commuters started taking issue with how SMRT did not publicly announce that the trains heading in the direction of Marina Bay were also delayed. So you never acknowledged the Marina Bay line delay till the end. Looks like a change in management hasn’t improved the reliability of information. This page only exists to downplay the situation. Train towards Marina Bay is also affected by the delay please. Both sides are affected.. Train towards Jurong East is moving but train towards Marina Bay is not even here. After the train fault was cleared, it was only at 9:08am that SMRT confirmed that train services have resumed normally. Still no acknowledgment that the train fault affected the southbound services as well. [NSL] UPDATE: Fault cleared, train svcs are progressively being restored. We apologize for any inconvenience caused. [NSL] CLEARED: Train svc from #Woodlands to #YewTee has resumed. Free regular bus svcs have ended. This article, First major train fault of 2019 sees commuters on North-South Line delayed for an hour, originally appeared on Coconuts, Asia's leading alternative media company. For more Coconuts stories, you can download our app, sign up for our newsletters, or follow us on Facebook, Twitter, and Instagram.